The Brot Max Bread Slicer is not the greatest thing since sliced bread. I will admit that it could use a good sharpening, but that said, the rather large and heavy "slicing" arm has the tendency to decimate anything vaguely resembling bread. This rather firm loaf is a good match for the cast iron behemoth. Michael Chiarello of NapaStyle fame was actually enamoured of this device and reproduced it for his catalogue. It has since disappeared as there were few takers. Still, it is a great addition to any home that has an inspired baker. Just make sure you have a good bread knife on hand. 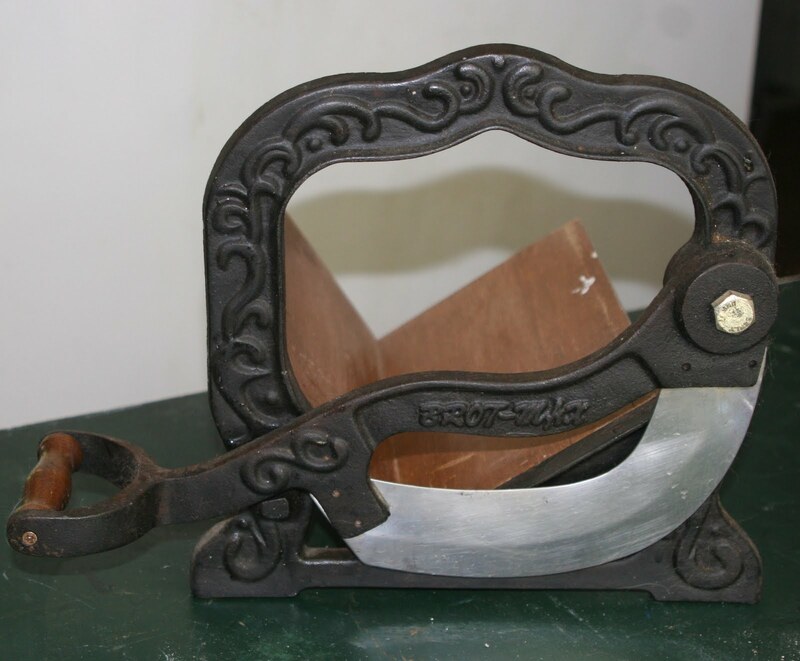 do you know the age of this bread cutter? This one was made in 1900. They were popular kitchen items from the late eighteen hundreds to the early nineteen hundreds. Maybe the most silly device I've ever seen in my whole life! It's used to cut dough, not bread. 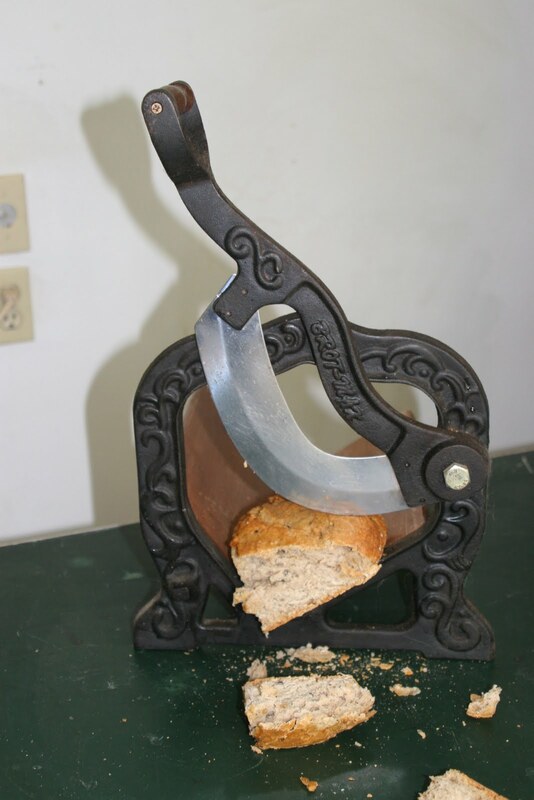 There are similar Bread slicers in Germany but the loaf they are used on is a non-rising approx. 4"X4"X16" WHOLE grain dark bread. You wont see them in the USA unless you have an ALDI's near you and they occasionally carry these breads - they are sliced very thinly. These breads also last a long time without getting rock hard stale, but they are not soft to start with. That's right ALDI's is a German chain and they carry a surprising amount of German food under the Deutsche Kuche Label.All you Trader Joe's lovers who would never set foot in an ALDI's because it's a food stamp clientele - jokes on you - it's the same Company. The Brot Max everyone is seeing are I believe a modern reproductions. If you look at the dimensions of the blade you can see it wouldn't take a very big loaf. Also "Brot Max" seem's like a fairly modern nomenclature, I don't think Germans a hundred years ago used the word Max that way. Looks great, Might do a better job with sausage though. Yes, the modern concept of "bread" and bread from 1900 are two entirely different items. We were fascinated at the bread slicing machines we saw in some French supermarkets next to the bread - sold whole, of course. Bill couldn't wait to play with it. Your contraption looks more like a guillotine for fingers to me! Occasionally our homemade bread turns out something like what would hold up to this machine - it's still good, but a small piece goes a lot way!